On Jan. 16, construction work continues on house No. 11 in Edgewater Village. George Diamond, the developer of Edgewater Village on the Albany riverfront, would like to step up the pace of construction, but on Wednesday the downtown urban renewal board (CARA) had a lot of questions, qualms and quibbles and seemed reluctant to approve a financing change that he needs to get going. The Diamonds, George and his wife Paula, have personally guaranteed a $2.4 million forgivable loan from CARA that, years ago, helped launch what the city envisioned as a way to revive what had been a dead zone of trash, weeds and rubble east of the Lafayette Street trestle, between Water Avenue and the riverfront Dave Clark Path. The development plan was delayed and changed several times as a result of the great recession and other factors, including the wishes of CARA officials. 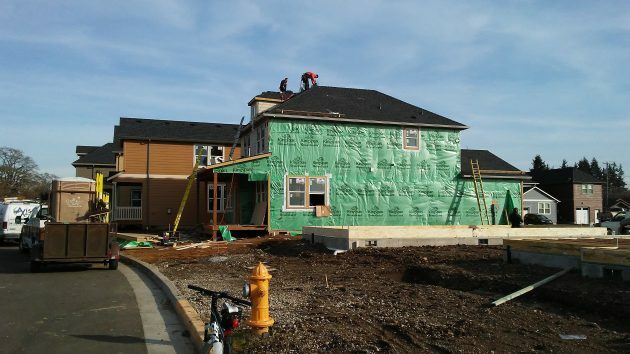 In one of the latest iterations, there were to be 60 homes including 28 townhouses, with $40,000 of the loan to be forgiven for each completed unit. So far, $360,000 has been forgiven and another $80,000 is pending. Of the 10 houses completed (the 11th is being finished now), none has been sold, but several have been rented. Diamond said he’s content to rent them to good tenants, as he has done, and wait until the market improves to sell them at a price that won’t have him losing money on each sale. The Diamonds now want to be able to borrow enough money from a bank to complete all the remaining street and utility improvements for the development and also build, all at once rather than piecemeal, the 28 townhouses on the west side of the tract, closest to the railroad trestle. To do that, they need the Albany development agency to raise its $1 million loan subordination limit to $6 million. (If you want to know exactly what that means, ask a bank or real estate loan expert.) They would also like the city to participate in the cost of building streets on two sides of a city-owned parcel in the middle of the development. CARA board members talked about this for more than an hour Wednesday. At one point Diamond said that if the city would release him from its contract, he would gladly walk away and let somebody else deal with this project. In the end, the board rejected a motion on the loan subordination but then, as far as I could understand all the mumblings, the board’s 14 members seemed to agree to have the city staff write up an agreement with Diamond that would then be put to a vote at a subsequent meeting. And for the rest of us, a contract is a contract. Once again, the rich get richer off the backs of taxpayers. CARA is a total ripoff and should be shut down. The way I understand it though, as long as they have a contract with someone for a “forgivable loan” they can’t be shut down. Good incentive to keep giving our money to the rich who can work the system. Wow!!! I do have to agree “piece meal” is not a good idea! When I have driven through that area I was disappointed. It does not look inviting. It looks as if the builders aren’t that interested in making it a lovely environment!! It could be “really special” as it is close to the river and downtown! CARA should have hesitated years ago to stop this $2.4M fiasco with the Lake Oswego developer. But the desire to spend other people’s money was just too intoxicating. Back then I made a bet with Councilor Ray K that this project would fail. I’m still waiting for him to pay up…. Since multiple homes have already been built & sold, many more in mid-building to completion… You already lost the bet..
Did Hasso get it wrong? According to his post none of the houses have sold. That makes it a failure to everyone, except CARA apologists and board members. It’s been so long ago, I can’t remember how much we wagered. But I still claim victory. I’ll look you up the next time I visit Albany. More than once, George stated that he personally bought the currently completed homes and now has good renters in them. He said he did that so that he will still realize a profit on them a year or two from now. Just another couple of welfare-suckers. If it’s not career welfare families it seems to be corporate welfare; and now here’s another category: “investment” welfare grabbers. Shut CARA down. Have you looked at your property tax bill lately? Maybe it’s time to do it. There you go again. Your total property tax bill is exactly the same with or without CARA. It seems tha CARA failed to analyze the market before sinking tax dollars into this development. If you believe what the developer is creating is a set of Starter Homes, a bit smaller and perhaps more affordable…well the prices for the homes built thus far are far too high and even a small family would find it difficult in the square footage. And one-car garages in a community where Mass Transit is nearly non-existent? It just seems out of step. If you believe the developer is building homes that would allow someone to down-size, the two-story configuration is all wrong, particularly for older buyers. It is unclear what the market is. Perhaps the developer knows something about home buyers I do not. Perhaps CARA was seduced by the thought of river front development…a nice idea, but filled with plenty of risk. Into this project. It might end up okay, but the financial fallout will be substantial. waiting for the market to get better? Kind of seems like that could be a long wait. Looking at a realty site, I see 50/50 split in the Downtown/N.Albany listings where half are under contract. Hardly a real estate recession. More interesting is that none of Diamond’s homes show up on the mls database. Looks to be more than content to rent.